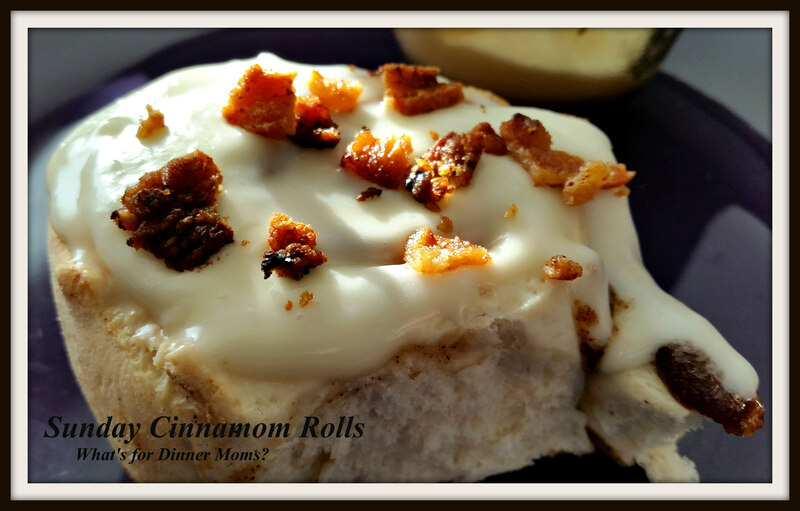 Sunday Cinnamon Rolls – What's for Dinner Moms? Why do I call these Sunday Cinnamon Rolls? Because that is the day we always make them on! 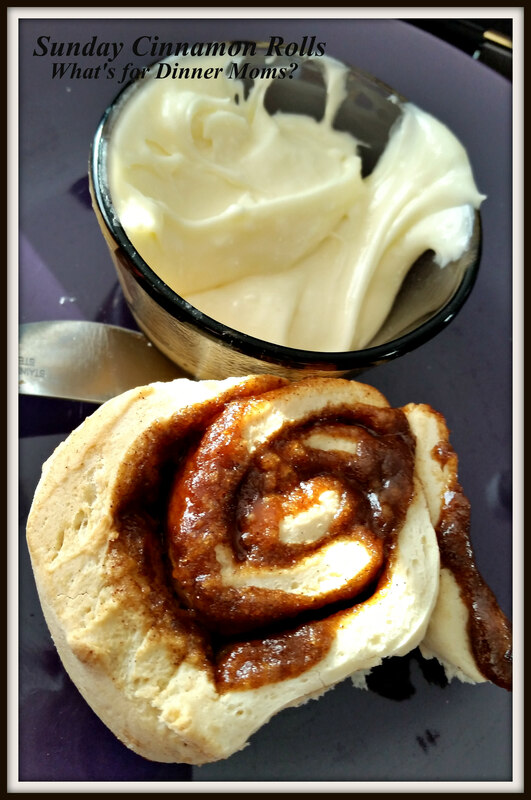 We don’t often have a lazy Sunday morning to make these but a couple of times a year we spend the couple of hours to make the dough, roll it out, make the filling, bake the rolls. They are usually for brunch, not for breakfast by the time we get them done. Everyone is usually very hungry by the time these come out of the oven so they disappear quickly. I added a sprinkle of bacon to these this morning because we had a bit extra to go with our cinnamon rolls. It was extra crisp and the saltiness against the sweetness of the cream cheese frosting was perfect! You definitely don’t need to add the bacon but if you want to go for it! My daughter suggested next time we add toasted pecans to them. That is what I love, even as we are eating the kids are now coming up with new ways to make the meal different or better. Change the frosting to maple and add bacon, make some caramel sauce and add toasted pecans, or a chocolate drizzle with roasted almonds would all be super delicious! Place ingredients into your bread machine in the order they are listed. Set for dough setting on your machine. Prepare a 13″ x 9″ pan with non-stick spray. Once dough has finished place on a lightly floured surface. Knead the dough a few times to make it easier to handle with a bit of flour. Once dough is no longer sticky roll it into a rectangle about 1/4″ to 1/2′ thick. Make the filling by mixing all ingredients together until well blended. Spread filling over the rectangle with a knife. Starting at the wider sides of the rectangle roll up tightly. Using a sharp knife cut the roll into 1″ wide slices. Lay the rolls in the pan. Cover with a clean towel and allow to rise in a warm spot (stove tops work well) for 30 minutes. They should double in size. Bake rolls for 25 minutes or until tops are golden brown. Remove from oven and allow to cool before frosting. I don’t even like cinnamon rolls, but these look amazing. Mine is mashed potatoes and gravy. I rarely eat dessert too. I like the savory over the sweet. Lol. Maybe a maple frosting too! I don’t like cinnamon, but the bacon looks tempting. I knew, I should have passed this one by today, but it looked so good. I’ve been dieting, but I’ll save this recipe for a special treat. Thank you! A treat once in a while is okay, right? Gosh, my mouth got watery reading the recipe!! I can’t wait to make these with the bacon! Thank you! I added the bacon because…Bacon!